Cumpay is one of three lines of cigars made by Honduran cigar manufacturer Maya Selva Cigars. The company is named for its owner, Maya Selva. Maya Selva Cigars has had a footprint in Europe for quite some time and recently has turned its attention to growing in the U.S. market. While the other lines made by Maya Selva Cigars have more of a Honduran tobacco focus, the Cumpay differs in that it is a Nicaraguan puro. Recently I’ve had an opportunity to smoke the Cumpay in the Robusto offering. Overall I found this cigar to deliver the boldness I would expect from a Nicaraguan puro – and it’s a cigar definitely worth checking out. As mentioned, even though they are new to most U.S. cigar enthusiasts, Maya Selva Cigars has been around for quite some time. In fact, this year the company is celebrating its 20th anniversary. The Cumpay is also a line that has been around since 1999. The name is derived from the Native Americans who once inhabited Central America and means rolled tobacco leaf. As mentioned the Cumpay line is a Nicaraguan puro. While it uses all Nicaraguan tobacco, like the other Maya Selva offerings, the cigar is produced in Honduras. The blend for the Robusto size is listed below. One noteworthy item about this blend is the incorporation of a binder leaf from Chinandega – an area located in the northwest part of Nicaragua just west of Esteli. 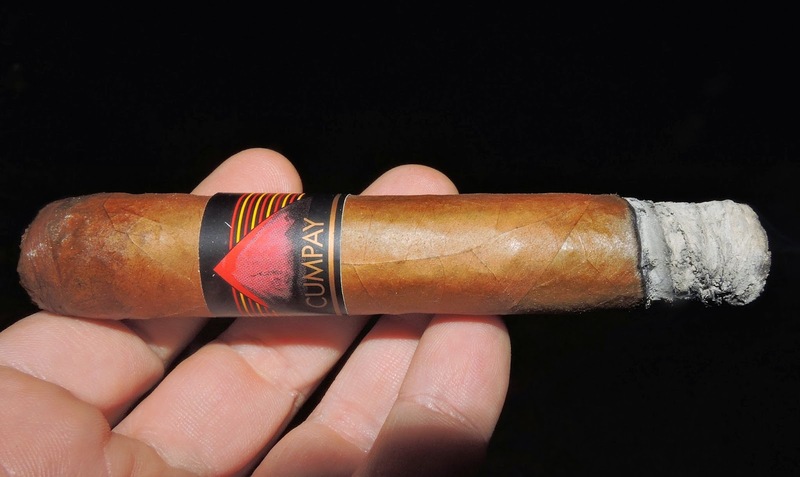 In addition to the Cumpay Robusto, there are six other frontmarks in the Cumpay line. One thing where Maya Selva Cigars differs from many other companies is that they blend for the specific size cigar they make. While each of the sizes of the Cumpay are Nicaraguan puros, the tobacco components (namely the binder and filler) of each size differ; thus each vitola is a different blend. The Cumpay Robusto is available in 20 count boxes, cardboard boxes consisting of 16 tubes, or four count packs of tubes. 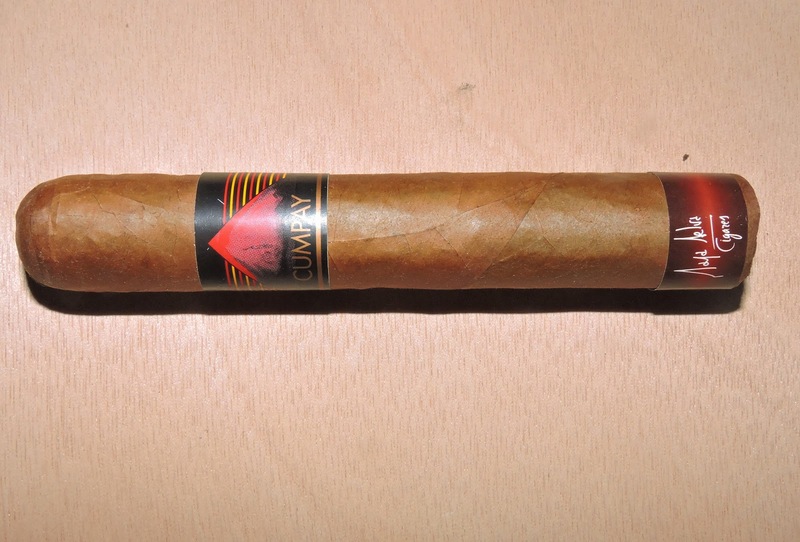 The Cumpay Robusto has a medium-brown colored wrapper that almost seems like a dark camel color. The wrapper itself has a light coating of oil and is quite smooth. There are a few of visible wrapper seams and there are also a few visible veins. With the Cumpay Robusto, I found this cigar to have somewhat of a tight pack. There are two bands on the Cumpay. The primary band is black and color. The front of the band features a red, orange and brown volcano image surrounded by red and gold stripes on each side. Just below the volcano is the text “CUMPAY” in brown. The second band is on the footer. It features a red to dark maroon gradient style background. Sitting on the background is the text “Maya Selva Cigars” in white cursive font. As I normally do, I started the cigar experience by placing a straight cut into the cigar. Once the cap was removed on the Cumpay Robusto, I moved on the pre-light draw. The dry draw of the Cumpay Robusto provided a mix of earth, nut, floral spice, and a sweet cotton-candy-like note. Overall I considered this to be a very good pre-light draw. At this point, I removed the footer band of the Cumpay Robusto, lit up my cigar, and prepared for what the smoking phase had to offer. The start to the Cumpay Robusto delivered a mix of earth, white pepper, and cedar sweet-spice. As the flavor profile evolved, the cedar notes moved to the forefront. There was some sweetness coming from the cedar, but I also detected a richer sweetness that reminded me of the cotton candy note on the pre-light. The earth and white pepper notes became secondary and were joined by a nut flavor. Meanwhile, the retro-hale was producing a woody, but not quite cedar-like spice. During the first half, I found the cedar notes continued to be primary with that cotton-candy-like sweetness also present from time to time. By the midway point, I found these flavors converged into a baker’s spice. Meanwhile the earth, white pepper, and nuts were still secondary. During the last third, I found the spice continued to ramp up. The baker’s spice and white pepper were now the dominant flavors. There were still notes of earth and nut in the background, but overall these had diminished. This is the way the flavor profile held until the end. The resulting nub was ideal – cool in temperature and firm to the touch. Overall I found the Cumpay Robusto to be a well-constructed line and this was reflected on the burn. From a burn perspective, I found the Cumpay Robusto took a straight path. It did need an occasional touch-up from time to time, but the burn was never in danger of tunneling or canoeing. The burn line itself was on the sharper side. The resulting ash had a silver-gray color. The ash was firm and came off the cigar in nice clean chunks. The burn rate and burn temperature were ideal. The tight pack of this cigar did make the draw a little more snug, however this was a good thing in my book. I personally like a little resistance on the draw and that exactly was how the Cumpay Robusto smoked. This made for an enjoyable smoking experience from start to finish. As I mentioned up-front, I found the Cumpay to be a cigar that had the boldness that I would expect from a Nicaraguan puro. At the same time, this is not an overwhelming boldness. Overall I found this to be a cigar to be medium to full in strength and medium to full in body from start to finish. I found a slight increase in both the strength and body along the way, but both attributes didn’t quite cross the threshold into “full” territory. In terms of strength versus body, I found both attributes balanced each other nicely with neither attribute overpowering the other. I mentioned “boldness” a few times and the Cumpay is certainly that. It delivers some rich flavors, has a nice strength level, and is going to deliver plenty of spice – all things I would expect from a good Nicaraguan puro. I terms of the spice, if you like it on your flavor profile, then this is going to be a cigar for you. At the same time, I never found the spice levels to be overwhelming. This is a cigar I’d probably steer toward a more experienced cigar enthusiast, but it might be one of those cigars to help a novice “graduate” to something bolder. As for myself, the Cumpay Robusto was an excellent cigar, and it certainly piqued my curiosity to smoke some of the other Cumpay sizes. It is definitely worth a box split in my book. I bought a Maya Selva sampler in Brest, France, and I just smoked the Cumpay Torpedo. I loved it and scored it 93… I live in Quebec, Canada and I’m trying to find out where I can purchase more of the Cumpay series. I usually buy online via Atlantic Cigar, Cigar Place or Famous Smoke Shop. They unfortunately don’t carry the brand. Please help me in finding more of these great cigars.